Home ArticlesAmazon’s Homeless Shelter: Can The Cause Be The Solution? 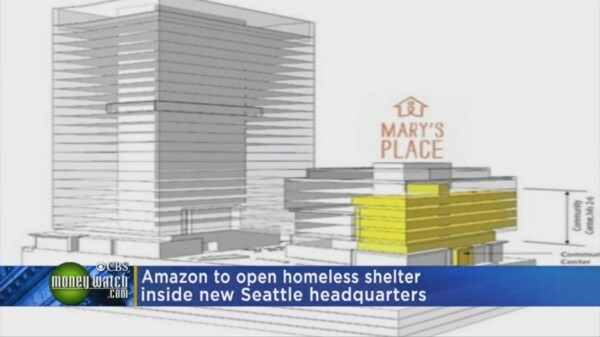 Amazon’s Homeless Shelter: Can The Cause Be The Solution? When is philanthropy just PR? Living in Seattle it is incredibly easy to fall prey to the myth of the benevolent corporation. This is the home of Starbucks and Microsoft after all, companies that pride themselves on a kind of liberal capitalist model that emphasizes multiculturalism, “responsibility”, and meritocratic opportunity. As Seattle expands from an infusion of capital leading to one of the highest population growth rates in the whole country along with a housing market bursting with value. The downside of this transformation has lead to some of the highest rents in the country along with an exponential growth in homelessness. To be sure, Seattle has had a noticeable and debilitating homelessness problem for over a decade. Non-profits, government entities, and faith organizations have been attempting to assuage the struggles of those living on the edge of homelessness through a variety of programs, but these efforts cannot keep pace with the rising tide of inequality. The facility will have its own entrance and elevators. Amazon will pay the utilities for Mary’s Place, which will occupy rent-free. It may be the first instance of business space that houses a shelter in the United States. While the aiding in some ways by essentially doing a buy out of the homeless shelter Mary’s Place that Amazon would do with your medium size valley startup, just throwing money at the situation, let’s put this expense into perspective. Over the past 20 years, average Seattle rents have risen almost 40 percent after adjusted for inflation. The biggest driver of homelessness is the expense of living, with people being pushed too far out suburbs forced to either deal with 2-hour commutes driving or have to rely on an underfunded public transit system. To many in the near poor and working class, this is the cliff’s edge to homelessness. Aiding a needy organization that does good things is one thing, but things like this need to be driven by the community and government. I wish Amazon gave way more money to the community, as they have had the reputation of being the “stingiest” when it comes to charitable giving. They have so much power in the community, bringing in a ton of money, and they have chosen to be absent, shaking up the housing and labor markets substantially in Seattle. At best they are cluelessly out of touch like a corporate Kenny Powers. We cannot think that just because we hear that a corporation is “giving back” or “investing in the community” can actually solve issues like homelessness, or traffic, where a third of the people on the road in Seattle are cruising for parking or rides with rideshare apps like Uber and Lyft. Amazon is filling up busses too full to stop every weekday because Amazon houses masses of interns at the University of Washington dorms. The impacts of monopolized power are global and transcendent; the value of our information and access in digital space is something we have all given up to these information mines like Amazon. But these impacts are local, in basic ways with issues like homelessness. The value of Amazon investing money into space with a separate entrance to use for a homeless shelter is cool and better than literally nothing which is what it seems like they have been doing as of late, but this is not an actual solution or, more precisely, a redistribution of power. The desire to maximize profit and use hyper-efficient systems, the defining characteristic of Amazon as a company, has no space or longevity to create a better balance between capital and the place it takes in our city. This libertarian gift giving will do nothing more than easing the burden a little bit. We cannot wait around for these benevolent corporations operating in the public sphere to act like a government. We need higher taxation on these corporation creating huge impacts on the daily lives of labor and neighbors, extracting value from society, not feel-good stories of philanthrocapitalism. Liked it? Take a second to support bpudashen on Patreon!